On Monday, the 28th of November,2016,at 7:08Pm West African Time (WAT), i received a message from the Google adsense team regarding being selected or invited for the Adsense Infeed ads beta. My curiosity regarding the new ad type that is only allowed in some accounts made me push forward to fish out more details on how it works and how best it can convert. At the end of the day, i discovered that the InFeed ads are a new format that you place inside your feed to help monetize your site and provide a better user experience to your visitors. For example a feed can be an editorial feed (e.g., a list of articles or news) or listings (e.g., a list of products, services, etc.). InFeed ads are native which means you customize them to match the look and feel of your content. In the past few months, i have seen quite a number of big blogs and website make use of this ads type but i was yet to be convinced if this ads was being served by Google or some other ads network. I guess my mind pondering got to Google and they had to reply me with a thumbs up invitation to make use of this ads format. Better user experience: InFeed ads offer a better user experience to your visitors. They're part of the user's flow and match the look and feel of your site. Monetizing new ad spaces: InFeed ads offer the opportunity to further monetize your pages by placing ads in new places, i.e., inside your feeds. 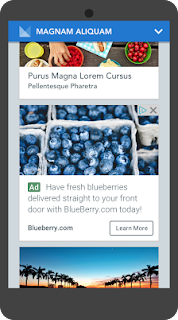 Ideal for mobile: InFeed ads are ideal for mobile as they can help you to better monetize the smaller screen spaces available on mobile devices. I really do not have any idea on how you can actualize such goal. If your account is selected, then you are good to go. You should be invited by the Google team before you can try it out. Please note that this can not be solicited for but is often approved by Google at their own disposal. Do you love the post? Let me know what you think about it in the comment box below. - They are highly customizable. - They use high quality advertiser assets. This is really wonderful news I guess. i also received this invitaion by the adsense team i2050 . but in confused it is better for earnings or not. so please suggest me about this native CPM ad. it is better for revenue generate vs normal standard ads. The placement procedure is almost similar to the way u place ur normal matched content ads. Please refer to ur dashboard.